Generate waves with added pulse waveforms such as a square, ramp, exponential, alpha, sine, cosine, etc. 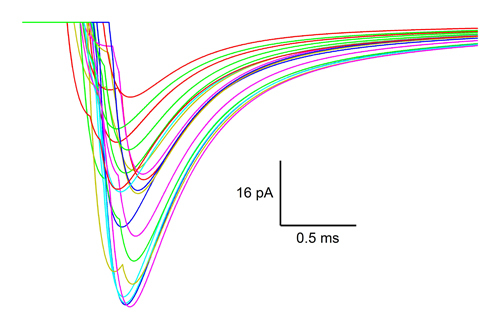 Simulate stochastic (binomial) synaptic release using synaptic-like exponential waveforms. Simulate trains of synaptic currents/conductances that exhibit short-term plasticity (i.e. facilitation and/or depression). Pulse waves can be used as stimulus protocol DAC output command waves (i.e. MyDAC waves) during current-, voltage- or dynamic-clamp experiments, or as synaptic conductance waveforms (gAMPA, gNMDA or gGABA) when using the Model Tab. At the top of the Pulse Tab, define parameters for the output pulse waves: number of waves to generate, wave prefix name (e.g. “Pulse” or “EPSC” or “gAMPA” or “MyDAC_0_”), sample interval (x-delta), wave length, x- and y-units. Select “–” in the top ListBox control to delete or turn off a pulse configuration. Select a row in the top ListBox control to display/edit a pulse configuration. 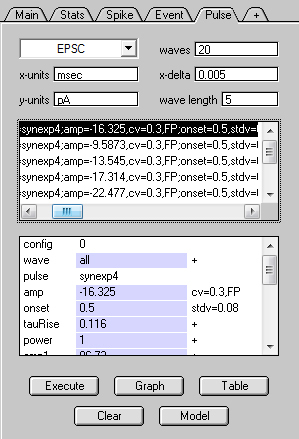 Parameters, such as onset, amplitude, width, tau, are displayed/edited in the bottom ListBox control. Pulses can be added to a single output wave (e.g. “wave=0”) or all output waves (wave=“all”). From wave to wave, pulse parameters can be incremented by a single value (e.g. “delta=0.5”), or vary according to a Gaussian distribution (Igor gnoise function; specified by parameters stdv or cv) or Gamma distribution (Igor gammaNoise function; specified by parameters a and b). Execute – generate the pulse waves. Table – display pulse configurations/parameters in a table for viewing/editing. Model – generate pulse configurations to simulate synaptic release via a binomial model (N release sites with release probability P), or simulate a synaptic conductance train with short-term plasticity (facilitation and/or depression). Default values are from cerebellar granule cell models (see images below). Each configuration is a semicolon-delimited list of all necessary parameters to create the pulse waveform. Variability can be added with parameters delta (constant increment), stdv, cv or gamma. A binomial pulse can be specified via parameters binomialN and binomialP. FP denotes fixed polarity. This figure shows overlaid simulated excitatory post-synaptic currents (EPSCs; n=20) of a cerebellar mossy-fibre to granule-cell synapse with 5 release sites (N), each with release probability P = 0.5. Configurations were generated by clicking the Model Button and selecting “Granule Cell Multinomial Synapse”. NeuroMatic generated a pulse configuration for each release site, with between-site Q variability CVQ2 = 0.3, within-site Q variability CVQS = 0.3, and quantal amplitude Q = -16 pA. The standard deviation of the onset latency for each site was 0.08 ms. Example configurations can be seen in the above screenshot of the Pulse Tab. More information about the multinomial model can be found in Rothman and Silver 2014, Saviane and Silver 2007 and Silver 2003. 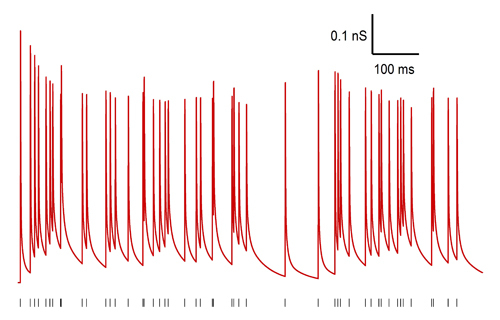 This figure shows a simulated AMPA-receptor conductance train (gAMPA; red) for a cerebellar mossy-fibre to granule-cell synapse stimulated at 50 Hz (black ticks). Configurations were generated by clicking the Model Button and selecting “Granule Cell Synaptic Conductance Train with Short-Term Plasticity”. The model contains a direct and spillover component, where each component exhibits short-term plasticity as determined by an R*P model, where R and P are dynamic variables that set the size of a synaptic “resource pool” and the pool’s release probability, respectively. Parameter values are from Billings et al. 2014. More information about the plasticity model can be found in Rothman and Silver 2014 and Schwartz et al. 2012.